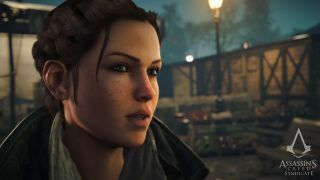 We've seen in-game footage for Assassin's Creed: Syndicate—from rooftop traversal to horse-drawn carriages and trains—but this new trailer is all about the protagonists: the twins, Evie and Jacob Frye. While they're loyal to each other, it seems they have their differences, which should make for a more interesting story given that you play both of them through the course of the game. Evie seems more optimistic about science and technology and progress, and for some reason she's slightly better spoken than her brother. Jacob is all about survival and his gang. You know, "the lads". The trailer is full of dramatic moments—fires, and fights in the rain—which, if Ubisoft stick to their promise, should look spectacular in PC version when it arrives some time after the console launch in October this year.